1 - 2 $2.00 ea. 3 - 4 $1.85 ea. 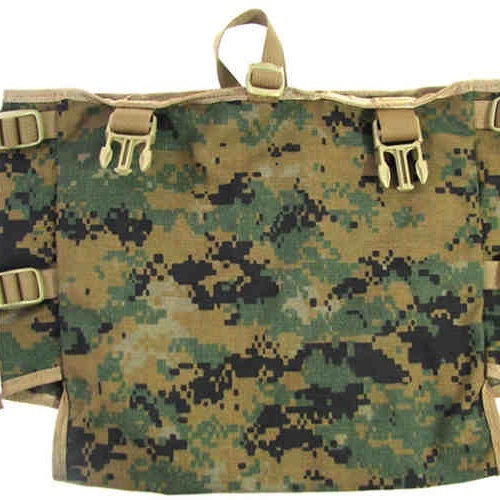 In nylon digital camo, this military radio bag measures 11" x 12" x 6" with adjustable straps on the side panels to pull them in, another to close the top, and a pair of female molle buckles to attach it to something else. Sew it all together, add a strap and you’ve got a great carry-all. Note openings at bottom corners. For you collectors, it’s marked "APB03 RADIO POUCH SPM1C1-09-F-C002 8465015158636 F190686393 TAMCN NO. 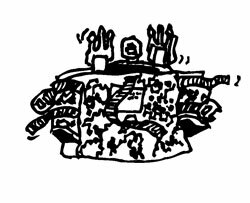 C54402F"
Call it the bag of a lesser messenger. 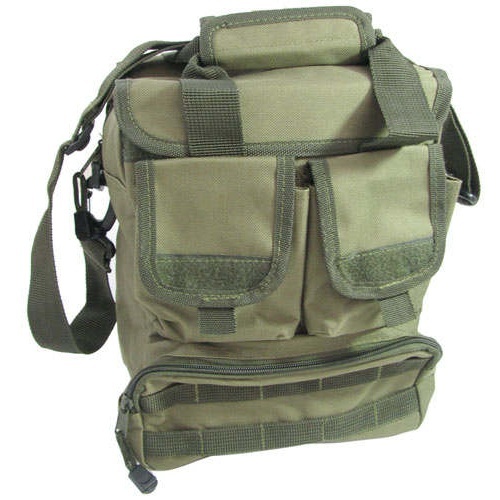 This dark olive Extreme Pak™ tote looks like a mini-backpack but has a shoulder strap plus a pair of handles. Measures approx 11-1/2" tall x 8-1/2" wide x 6" deep front to back, it's got a big inside zippered compartment, a smaller zippered pouch on the bottom, a pair of hook-and-loop closed pockets on the top, plus a plethora (that'd be 10) of band loops to hang stuff off. Mfg suggested retail is over $30. Just saying. 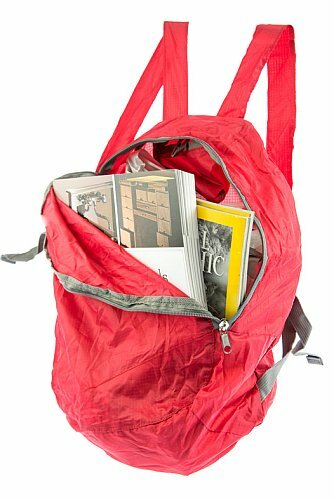 Super lightweight red nylon day pack, perfect for packing on vacation or for regular kiddie use. Measures 17” x 11” x 5-1/4” when unfurled with 30” adjustable straps. Has an integral carrying pouch on the inside top, so it can get completely inside itself (which is more than we can do) into a neat 5-1/2” square bundle. Zippered top closure. 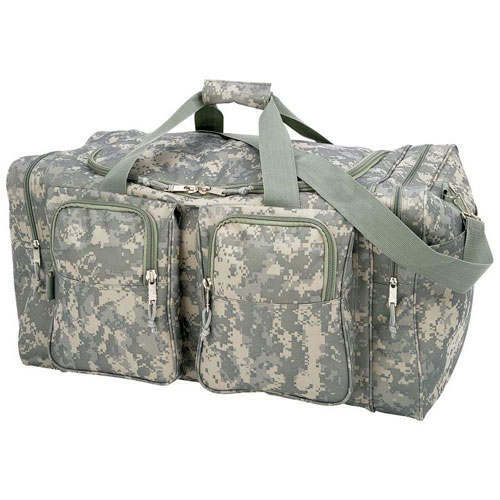 Our big square duffel bag is made of water-resistant polyester canvas in a digital camo design, perfect for members of the military or anyone who wants to hide luggage in the woods. Measures 25" long x 14" square with 14" square x 2-1/2" pockets on each end with slide-in compartments on the outside and a pair of 9" x 10" zippered pockets on the front. Light olive canvas handles and a matching detachable shoulder strap. 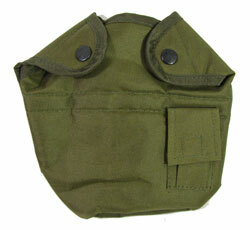 Originally a canteen pouch with two little mouse ear flaps that wrap around the top and snap closed, this insulated olive drab bag could double as a purse or a dog bone holder. Which technically would make it a pooch pouch. Measures 7-1/2" x 7" x 2-1/2". Snap straps on the back let you clip it to your pack or belt. If your times are a-changing, you'll love this teal (which is the new orange) diaper bag. Measures 14" x 15" x 4" as carried on the 1-1/2" wide shoulder strap, but the top opens to become a 41" long changing pad. Closes securely with (2) hook-and-loop tabs and has a bottle pocket on the side. 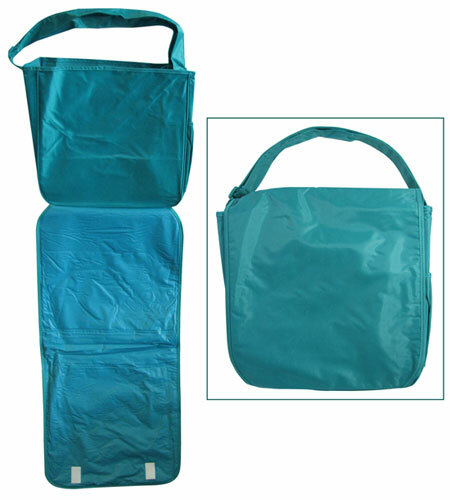 It's also great for the beach because of its big storage compartment, its fold-out-ness, and its Caribbean-conjuring teal. Also, while we wouldn't suggest carrying water in it, it's fairly water-tight. Not for big fish, but for someone with a lot of dirty laundry or a bunch of unwieldy sports equipment to tote. 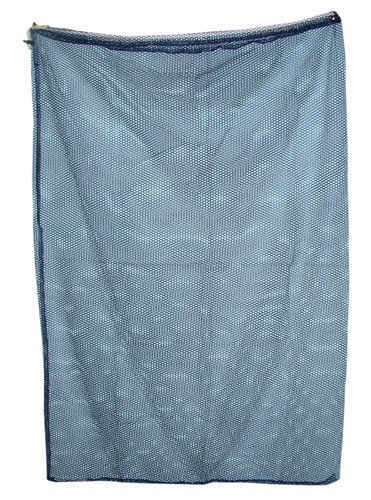 In dark mesh, 54" long x 32" wide with a drawstring. Buy it for the coach or athlete in your life. Or for the launderer in your life. 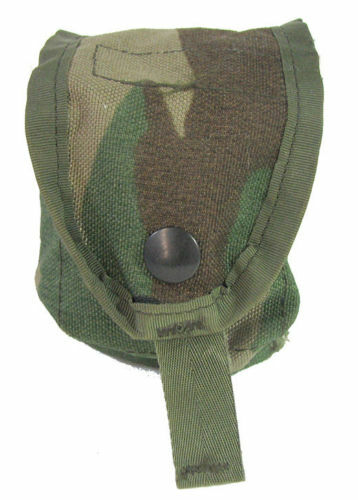 These olive/brown canvas camo grenade pouches measure 3-3/4" x 3" x 2" with snapping top flaps and (2) 1” wide snap-on belt straps on the back. 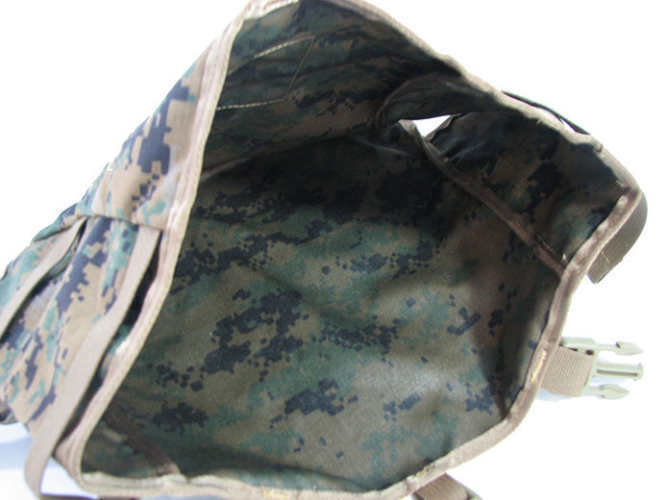 Made in the USA and marked “NSN 8465-01-465-2093 DAAK60-97-D-9302" which is a lot of numbers for such a little pouch, but that’s the military for you. 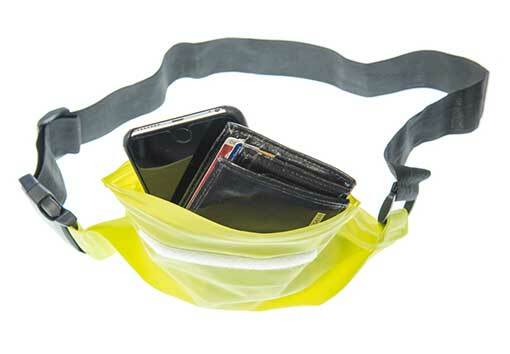 This storage pouch, in safety-vest-chartreuse, is 9” x 2” x 2” with a 2-step zip-lock and hook-n-loop water-resistant seal. Good for walking in the rain, biking, sailing and triathlete-ing with valuables, either strapped around your waist with the adjustable elastic belt and molle buckle or not. The pouch is gusseted, which means it’ll also open to 4” wide—perfect for a cell phone. In bright orange, with reflective piping on the back, this survival rescue pack measures 17" x 13" x 6" and the whole back unzips to reveal 11” wide mesh pockets at 5-1/2” and 7-1/2” deep plus (2) more of the same size, plus side pockets at 6-1/2" x 5". 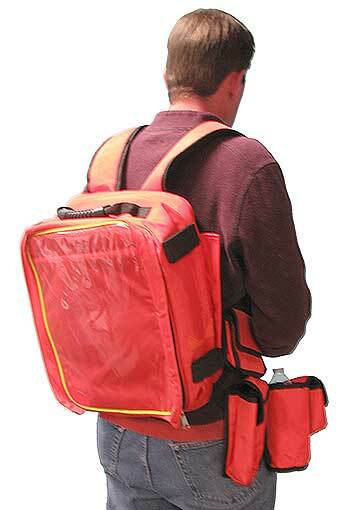 Includes a removable 12” square weather resistant map case, and the exterior has a 6” handle on top, (6) mesh pads to keep your back comfortable and allow airflow, (2) padded adjustable shoulder straps with more straps with hook’n’loop fasteners and plastic hooks to secure them and attach gear. Additionally, there are (2) waist straps, the top having (2) large 8" x 6-1/2" pouches, the bottom with (1) large pouch on the left and (3) various useful sized ones on the right for phones, water bottles and more. Also included ski pole sleeves.